(CNN) -- With a single tweet on Sunday evening, Melania Trump made it official: the White House is no longer operating with a first lady in absentia. FLOTUS has moved in. "Looking forward to the memories we'll make in our new home! #Movingday," read the tweet, which featured a picture from inside the Executive Residence, past the Truman Balcony, overlooking the South Lawn. On what appeared to be a set dining room table, two tall, tapered candles in silver holders were lit. Her choice to remain in the couple's New York City penthouse until their son, Barron, 11, finished the school year, while unprecedented, was certainly her prerogative as a parent, as disruptions impact children. However, her communications director Stephanie Grisham tells CNN that Trump is now more than ready to be a D.C. resident. "The first lady is very excited about this chapter in their lives. She recognizes this as the true honor that it is, and looks forward to their years ahead in the White House." In February, Trump announced she had selected an interior designer, Tham Kannalikham, to decorate the family's private living quarters in the White House -- more than a dozen rooms -- a job that presumably is now complete. Kannalikham did not return a request for comment. "The first family's move-in must be flawlessly executed," said Rear Admiral Stephen Rochon, who served as director of the executive residence and chief usher at the White House under both Presidents George W. Bush and Barack Obama, until 2011. "Very importantly, décor of the rooms for Mrs. Trump and her son must be closely coordinated with the first lady's interior decorator. Hopefully, many of these things were done before President Trump moved in more than 100 days ago," Rochon said. "She is no longer employed here at the White House," said principal deputy press secretary Sarah Huckabee Sanders at the time. "We left on very good terms and wish her the very best and certainly hope for great things for her in the future." "I left a detailed list, and met with (Reid) to answer any questions," said Rochon. "I understand that Mrs. Trump's son's comfort is her top priority, so the chief usher must do everything possible not to disappoint her. (Moving to the White House) can, indeed, be organized chaos." But by the time the rest of the Trump family arrives, they should have everything they need at their fingertips. Clothes will be unpacked in the closets, settled in the bureaus; toys and books and personal items will already be set up per the first lady's selection, the fridge stocked with favorite snacks preferred by the first lady and the littlest Trump. "It's definitely a '10' on the scale of exciting moves that we have handled," says Chuck Kuhn, president and CEO of JK Moving Services, a Virginia-based moving company that has both moved presidents into -- and out of -- the White House, including both Bushes and the Clintons. Kuhn said he hasn't been involved with the Trump moves, but that he'd "welcome the opportunity" if asked. The movers go through background checks, and the trucks are inspected before going onto the grounds, said Kuhn. But from the driveway into the house, moving is handled by residence staff. It's up to the chief usher, or now the deputy usher, in the absence of a replacement for Reid, to oversee everyone -- and take care of, well, everything. "When I was there, we had 95 full-time staff members to include the ushers' office, operations staff, who move furniture, rugs, et cetera," said Rochon. "And then the executive chefs and pastry chefs, housekeepers, electricians, carpenters, engineers, plumbers, painters, florists and very importantly, the butlers, whom the first family sees, first and last, every day." In sum, it's a lot. Melania Trump will rely heavily on the head usher, said Rochon, whose job it is to navigate requests on her behalf. "The chief usher is the first lady's primary contact in the executive residence to get anything done there," he said, adding he suspects at this point the painters, carpenters and movers have already completed décor tasks. "It's the little things you miss," said Michelle Obama to Oprah Winfrey at a women's summit in Washington last June. She was talking about life inside the White House, and how just walking out the front door "without discussing it with anyone" becomes a big deal. "Sasha opened her window once (in the White House) and there were calls. It never opened again," Obama said. 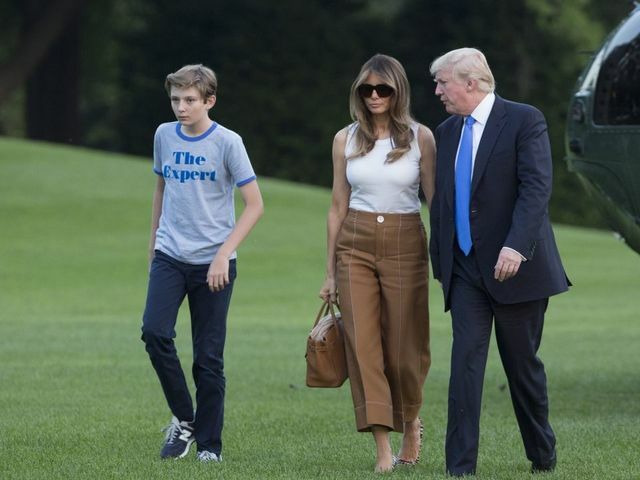 "Even though FLOTUS and Barron are moving to the '18 Acres,' as the White House and its grounds are nicknamed, over time, all occupants inevitably feel trapped," said Jonathan Wackrow, a CNN law enforcement analyst and former Secret Service Agent, who spent time on a first lady detail. "In New York City, both of them basically hide in plain sight, blending into the fabric of the city is an easier task," he said. "Privacy becomes the most craved desire, but it can be hard to come by," said Wackrow, adding it falls to Melania Trump, as it did to Michelle Obama, to help her family adjust. The addition of Secret Service, motorcades, sirens and armed guards is a jolt, said Wackrow, although it is likely helpful that Trump has had a significant taste of what that's like for the past several months. "The DC pressure is a new normal for the family. All of them, the President included, will need to find a tempo that works for them to create an environment that is their own," Wachrow said. For example, President Barack Obama often said it was helpful that he "lived above the store" so he could eat dinner with his family, before working later into the night. "He and Mrs. Obama would also workout together in the mornings a good deal," Wackrow said. And while perhaps a morning bout of couples' exercise won't be on the Trump's agenda, they will presumably find a way to co-habit inside the bubble of the Residence. "They'll do what works for them," said Wackrow. A platform of initiatives is still in the works, although the first lady has publicly stated women and children's issues are of importance. "It took Michelle Obama a year to announce 'Let's Move,' so there is time," said Kate Andersen Brower, a CNN contributor and author of "First Women: The Grace and Power of America's Modern First Ladies" and "The Residence: Inside the Private World of the White House." "It was also one of the more stressful parts of those first few months for Obama, trying to zero in on a campaign that she felt strongly about and that wouldn't offend (too) many people. I don't know what Melania is considering but with all the turmoil in her husband's administration this doesn't seem like a priority," Brower said. So far, in Washington, Trump has visited a children's hospital and a couple of schools. She's hosted one official "ball" (February's Governors Ball), presided over her first White House Easter Egg Roll and given a speech on female heroes at the State Department, to name a handful of her most notable Washington experiences to date. Last week, she and the President stepped out on the town for the first time, well, not counting a few steak dinners at the Trump International Hotel. The couple attended the Ford's Theatre Gala, Trump dressed in a Champagne-colored, flowing $2,595 silk frock by designer Monique Lhuillier. The next night, they hosted a reception at the White House for Gold Star families. The job of first lady isn't salaried, nor is it outlined with any formal description, but tradition and history, which Trump appears to relish, dictate the wife of the President be a present, photographed, quoted and relevant member of the administration. It's now up to Trump to establish just what kind of first lady she will be. "The first first lady to popularize having a campaign was Lady Bird Johnson with the highway beautification act," said Brower. "Rosalynn Carter took on mental health; from then on, having a message has been really an expected part of the job." On Friday, Trump got in on the fundraising part of the gig, putting her name to a letter asking supporters to sign a birthday card for her husband, who turns 71 on June 14 -- signing requires a donation to the Trump Make America Great Again Committee. "I need your help to make it a birthday my husband will never forget," said the letter. "Our celebrations always include family and close friends."